There's a bit of the gambler in every upland bird hunter. No matter the experience or preparation, there are just too many variables to really predict the course of a day in the field. To really see the variables eclipse the predictable, take a still-junior pointer out for an East Coast, end-of-season spring hunt at a preserve you've never before visited. As we dialed the phone to set up a last-minute outing, we cringed a bit at the not-known stuff. Was it too late for good-flying birds? Would a spring rain or fog sock us in? Would it be only unattractive, old, dead cover atop nothing but muddy ground? Was a bad attack of crazy-dog spring fever going to make the whole thing a real mistake? On the other hand, the potential benefits were awfully tantalizing: with the warm weather fast approaching, this was a soon-to-be-missed chance to give the inexperienced dog some more street smarts. And two comparatively green wingshooters were looking for a chance to internalize a few more bird encounters before resigning themselves to a summer of clay pigeon shooting. So, willing to take a few chances, we made the gamble. The dice landed on Gunpowder Game Farm. "Gunpowder," as it's usually called, sits in Hampstead, Maryland. 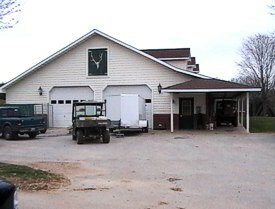 The village preserves, just barely, its small-town rural roots and atmosphere even as development pushes in from all sides. The hunting party hails from the DC suburbs, and the farm, to look at a map, seemed an effortless hour or so away. We'd actually been resisting a trip to this property (despite glowing recommendations from friends and family) lest it simply prove too good to be true. With one last look at their web site, we called and left a message, and in short order received a call back from the fairer half of the husband and wife proprietors. A quick conversation with Wendy assured us that there were robust birds to be had, and that though they were usually booked solid for the very last day of their season, one of their parties had scaled back a bit, and there was a slot available to us. After making some brief arrangements, and confirming our sense of the drive to Hampstead, we said our thanks and promised to be at the farm the next day. Gunpowder typically operates in a two-shift mode, with parties hunting from 8:00AM to Noon, and again from 1:00PM to 5:00PM. That last slot was in the afternoon, so we felt comfortable knowing we wouldn't be having a morning rush to get to the farm. Our gamble started to pay off on our Thursday morning drive to the farm. The north of Maryland, west of Baltimore, is a beautiful area, and with just a hint of spring green showing in the woods and fields along the way, we enjoyed the trip up through Damascus, Mount Airy, Westminster and on to Hampstead. Realizing we were going to be a little early, we stopped in Hampstead for a quick take-out sandwich to fuel our impending time in the field. With advance notice, the folks at Gunpowder will prepare lunches, but we simply hadn't planned that far ahead. A few minutes down the road out of Hampstead, and we found ourselves on Gunpowder Road, and we quickly spotted the handsome wooden sign that marks the property's entrance. Given the very reasonable price per hunter, we had set our expectations at "modest" (as that helps alleviate any disappointment), but immediately realized that the owners truly cared about first impressions. The entrance to the home and grounds felt manicured and park-like, even after a damp, gray Mid Atlantic winter. A well-paved driveway, lined with hardwood trees, took us up a gentle hill towards the house, and the lodge just behind it. As we approached the lodge, we saw - across the drive in an adjoining acre or two - quite the row of Chukar houses and a very substantial series of pheasant flight pens. Having seen the size of the operation, it came as no surprise when we later found out that the season just ending had seen the preserve put 25,000 birds in front of hunters. That's a lot of work, and a lot feed. Parking near the flight pens, we walked over to the large lodge structure, which is reminiscent of a barn in design, but is perhaps more of a peaked garage/warehouse in practice. Looking around before we went in, it was clear that the owners were not just game bird farmers: the lodge's upper hayloft-type doors were crowned with a monumental elk rack that spoke volumes about the folks whose grounds, birds, and hospitality we were about to enjoy. Inside the lodge we found a desk area laid out with the traditional preserve waiver paperwork, clipboards for hunter information, and sales receipts documenting the farm's understanding of what each party was there to do. We were pleased to see, on the ticket bearing our names, that a fleeting element of our original telephone conversation had made it right to the reservation paperwork: in the margins of the receipt was written, "Young shorthair – runs big." The lesson is that Wendy is listening when you're talking to her on the phone, and that she's thinking about what she's just heard when choosing a field for your party. That may be just what you'd expect from a game farm, like Gunpowder, that's been serving upland bird hunters for 15 years - but compared to the customer service that one often doesn't get from other types of businesses these days, touches like that are a breath of fresh air. We had finished filling in our hunter information forms, and while we waited for Wendy to come over from the house and wrap up the paperwork, we looked around the lodge. It's set up essentially as one big space, and while it is used to store some equipment and gear, it's cheerily warmed by two hefty woodstoves and sports enough tables and chairs to comfortably seat a couple dozen people for a meal. There's a large walk-in refrigerator stocked with drinks and other supplies, a comfortable and clean restroom, and an area well set up for bird cleaning. Finishing the pre-hunt paperwork was quick. 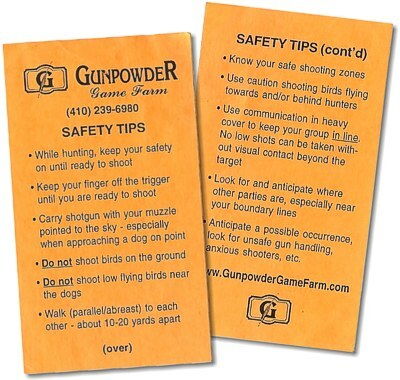 Both hunters had Maryland licenses, though Gunpowder can issue local one-day preserve licenses as needed. Along with verbal direction from Wendy, we got some well thought out hunter safety cards, and an aerial photograph of the bird fields. Before driving up to the field, Wendy took us on a virtual tour of the field, marking up the 8x10 hardcopy with a highlighter to show us the approach to and boundaries of our zone. She pointed out the low spots, a stretch of hardwoods where we might find some birds, and showed us some landmarks that would help to keep us from our neighbors' hunt. Knowing we hadn't been up to their fields before, Wendy offered to hop in a farm vehicle and show us the way. We tailed her up a well paved ribbon of asphalt behind the lodge, and wound our way up the hill. We were somewhat surprised to find ourselves driving past some other residences and farm buildings - all beautifully maintained - that illustrated the inevitable chopped-up-edness of huntable terrain in semi-rural Maryland. Any concern about being too close to these places, though, disappeared when we crested one more hill and saw the top corner of our field open up in front of us as we pulled off the paved road and onto a slightly muddy dirt track. In March, there's no such thing as an unpaved lane in Maryland that isn't at least somewhat muddy, but being on the straight and level, the SUV never had to get out of two-wheel drive. Wendy pulled over near a bordering band of woods and recommended we leave our vehicle there, just around the corner from our field. The trees would make a nice buffer in case some stray seven-and-a-half pellets sailed towards all that shiny SUV surface area. There wasn't much else for Wendy to tell us, as her virtual tour of the field while we were back in the lodge had covered things nicely. Bidding us a good hunt, she told us we'd see her again sometime during our 4-hour session, and off she went. Setting out from the truck, we walked along some cut corn stubble and into the top corner of our designated field, which opened up as a roughly 50-acre bowl spreading out to our right. A soft breeze was sweeping up the hill towards us, catching the scrubby cover and swirling around enough to provoke our German Shorthair into some initial racing about. Before we had headed up to the field, the preserve's hand had gone out on an ATV and seeded the cover with birds. Knowing we had a green dog, we'd asked for 20 quail, hoping the tight-sitting birds would present less of a challenge for the pointer's still-amateur steadiness. Gunpowder will also put out pheasant and chukar in various mixes, but we decided to keep the variables to a minimum. The quail turned out to be a good choice, since the cover was end-of-the-season sparse, and those little Bob Whites could make the most of every little patch. The previous season's growth had been beaten down by snow and decay, but was still dense enough to make those birds disappear. For the next two hours we got to know the ground, the wind, the foliage, and the birds' resulting behavior. 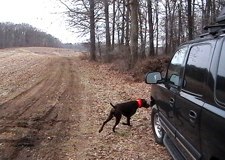 On our first pass through the field, our dog encountered perhaps half of the 20 quail we were hunting. The birds held tight, but flew fast and long when kicked up. Once or twice a bird broke up near where we walked, but most took their chances on our dog not finding them. Of course, with a shorthair, that's a losing bet, and we did pretty well. The rises and creekbottom at the foot of the field held the thickest cover, and birds flushed from there made uphill and for the woods. Wendy had mentioned in passing that we should work the margin of the woods, but we got to part of it sooner than we planned when our knuckle-headed dog broke after a missed bird and trailed it 50 yards into the woods. We spotted him by a large fallen tree, pinning Bob White (otherwise unharmed) down with one foot while giving us a satisfied wag. Dogs. The wind shifted and picked up to a steady 15mph or so, and we decided to collect our wits and approach the field a bit more methodically. The big shorthair seemed to be on fire for the birds, so we thought we'd try something counter-intuitive, and worked with the wind to our backs. As the dog quartered in front of us, he'd catch scent cones as he passed their source, and wheel around into a caught-off-guard point that tended to be stauncher than those that he established while roading in from down- or cross-wind. We may not have known where Gunpowder planted all the birds, but we knew they were out there, and used the partial predictability of the scenario to teach the dog, and ourselves, a thing or two about spring quail hunting in a slightly damp, increasingly brisk, raw March wind. The bowlish shape of the sloping field seemed to channel bird scent into a real highway for the dog, and the previous hunts of the morning and day before left some very strong hot spots (chukar feathers and all) for the team to work through. Both hunters carried 20 gauge shotguns, loaded with an ounce of 7-1/2 shot. One gun was a Benelli autoloader with a modified choke, and the other a Browning over-under, shooting improved cylinder and modified. That recipe seemed just right when the shots were safe, but working with a dog that's not always steady, and hunting on a gentle hillside, some shots just don't work out. Once or twice the longer reach of a 12 or a tighter choke on one of the 20s might have been nice, as the shallow scooped-out hillside sometimes presented a clear, but longer shot at a going-away bird. The next field zone over had a party with a pair of Brittanies and three gunners shooting hefty twelves at pheasant and chukar. We caught sight of them a couple of times, but never felt particularly crowded. 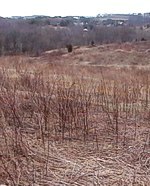 There were natural boundaries between our zones on all but one side, down the middle of a hill that was marked off with very visible stakes. Our pointer had a couple of thoughts about going over to help out with those pheasants, but we kept him busy with the quail and we never crossed paths. About two and half hours in, we heard the putter of a ruggedized golf cart. It was Wendy, making rounds. With another Brittany riding shotgun, she carried a payload of 5-gallon plastic buckets. She asked if we'd thought about whether we'd like them to clean up our birds for us, and if so, she'd take what we'd already bagged and get them down the hill to the lodge for a head start. We'd already had a busy day keeping up with Mr. Shorthair, so at $0.85 per bird to breast the quail, that deal sounded perfect. We unloaded our game pouches, and got one more reminder from Wendy to check out the woods before we called it a day. After a breather and some water for dog and hunters, we decided it was time for one more go. Now, there's nothing like having another pass through the field with a dog that's finally blown off some of that youthful steam. We got to appreciate the fine job that the bird planter had done, and with the wind shifting yet again, came across some birds that we must surely have walked right past an hour before. And, true to Wendy's word, the brush and stumps at the edge of the woods produced another pair of birds. It was coming up on 4:30, the light was starting to fade a bit, and we decided that the day's lessons were over. Our pointer had just done a nice retrieve to hand, and we wanted to end on a good note. After a quick count, we knew we were leaving a few quail for the pair of sharpshin hawks that we'd heard chatting in the woods. And if they didn't get them, the local foxes probably would. With a few more birds in hand, we saddled up in the truck, and made our way back down to the lodge. Waiting for us were our birds, now in the form of clean, neatly dressed breasts. The hand was there to clean up the rest, which he did with the speed and skill that can only come from having done it thousands of times. While we're more than happy to clean birds, the minimal expense felt very reasonable, and took one more chore off the end of the day. We chatted a bit with the hand, squared up with Wendy, took one more look around the lodge, and vowed to return again in the fall. Happily changing boots for comfortable shoes and shedding some blaze, we drove back off the property and headed home. Passing through nearby Westminster, we found a first class coffee shop and decided that a nice warm cup would help with the rest of the drive. Only an hour or so later, we were back in the sprawl of the DC suburbs, and the more industrious half of the hunting party amazingly still had the energy to turn those quail breasts into the sauteed centerpiece of a perfect hunting day's dinner. 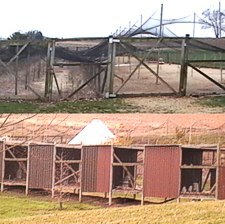 While the proximity of Gunpowder Game Farm to the DC/Baltimore region is, by itself, a compelling quality, the surroundings, the mix of professional courtesy and warm hospitality, and the high quality birds would make it a worthy destination regardless of location. This preserve is not trying to simulate a day afield after pheasant in South Dakota, or mimic a Georgia plantation's pine forest quail hunts. Rather, it presents just what a Mid-Atlantic suburbanite bird hunter perhaps most craves - an opportunity to just head into the local countryside for some of the bird hunting that our grandfathers used to do. No huge travel plans or big productions, just a place run by some folks that obviously wanted to scratch that same itch, and have built up a substantial business around putting it in reach of the rest of us. Our thanks to Gunpowder for a great day, and our assurance that we'll be back for more. Quail. Birds were farm raised by the owners, but were lively, strong fliers. Chukar and Pheasant were available, but not chosen for this hunt. These folks run their operation like clockwork, and have obviously put a lot of sweat and treasure into creating an environment to which you'll want to return. The business end of checking in and getting up to your field is quick, the setting is beautiful (and amazingly near to some large metro areas), and the proprieters clearly love the sport and want you to, too. Adjoining fields mean that you might see or brush up against other parties. Not an issue with thoughtful gunners and well-mannered dogs, but something to keep in mind. There are some nearby farm structures that novice gunners will need to keep in mind, but nothing dangerous. Some cover consists of aggressively thorny growth, which can be a little rough on shorthaired or tender-footed dogs and hunters without rugged outer layers. But, that's upland bird hunting!